The historic Mayacamas cellar, known for its Cabernets, will now be overseen by Andy Erickson, while his wife, Annie Favia, will manage the vineyards. Napa Valley's historic Mayacamas Vineyards has been purchased by investor Charles Banks and his wife, Ali, in partnership with retail entrepreneur Jay Schottenstein and his son, Joey. The sale price was not disclosed. Banks, the former president of CSI Capital Management in San Francisco, served as managing partner at Napa's Jonata and Screaming Eagle wineries before leaving in 2009 to found Terroir Capital, a winery, restaurant and hotel investment group. The Schottenstein family purchased Carmel Winery in Israel earlier this year. One of California’s oldest boutique Napa wineries, Mayacamas Vineyards made its reputation on distinctive, long-lived Cabernet Sauvignon and Chardonnay. Banks fell in love with Mayacamas about 15 years ago, he said, when he was given a magnum of 1970 Mayacamas Cabernet for his 30th birthday. He called it one of the greatest Napa Valley Cabernets he’d ever tasted. “I’ve been poking around Mayacamas for six years now, trying to work with [owner] Bob Travers,” Banks told Wine Spectator of his efforts to purchase the property. Located on Mount Veeder in the Mayacamas Mountains that divide Napa and Sonoma Valleys, Mayacamas Vineyards was founded in 1889 by John Henry Fisher, a San Francisco pickle merchant. 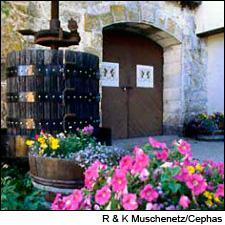 The winery fell into disuse after Prohibition, but was rejuvenated in 1941 by Jack and Mary Taylor. In 1968, former stockbroker Robert Travers and his wife, Elinor (Nonie), bought the winery and, under their tenure, Mayacamas became known for intense, rustic and firmly tannic mountain-grown Cabernets. Travers will not stay on with the winery. “After about 44 vintages, I’m sure he’s happy to be retiring,” said Banks. Husband-and-wife winemaking and vineyard management team Andy Erickson (also formerly of Screaming Eagle) and Annie Favia will be heading up the winemaking and vineyard replanting efforts. The 465-acre Mayacamas Vineyards property currently has 52 acres under vine, planted at elevations ranging from 1,800 to 2,400 feet. Banks said that replanting will begin immediately, with an ultimate expansion to 60 to 75 acres of vineyards, planted mostly to Cabernet Sauvignon, Merlot and Cabernet Franc; some old-vine Chardonnay will be spared the replanting efforts. The original 1889 stone winery will be retrofitted to meet their winemaking needs. Banks and real-estate mogul Stan Kroenke founded Jonata, a Santa Ynez Valley label, in 2004, and they purchased Screaming Eagle from founder Jean Phillips in 2006. In 2009, Banks left Screaming Eagle and Jonata to start Terroir Capital with a group of investors, purchasing South African brand Mulderbosch. The group currently owns eight other brands: Sandhi, Leviathan, Argatha and Wind Gap in California, Burgundy’s Maison Loree, and Fable and Marvelous Wines in South Africa; Terroir's California-based Cultivate brand bottles wines from around the world, raising funds for non-profit organizations. Banks is also a partner in Tennessee's Wine Spectator Grand Award-winning restaurant Blackberry Farm. Jay Schottenstein is chairman of American Eagle Outfitters and DSW. Earlier this year, the Schottensteins were part of a consortium of international investors that purchased Carmel Winery in Israel, originally established in 1882 by Baron Edmond de Rothschild. Banks is looking to expand his winery investments further, noting that he’s looking at “several other deals announcing in the next few months.” But after six years of working on a deal to own Mayacamas, he’s very excited about continuing the tradition of making ageworthy wines like the Mayacamas he fell in love with. I am a long time club member of Mayacamas and I am not happy with these news. I find it very hard to believe the new winemaker will keep the same style that makes Mayacamas unique, specially with this corporate owner. For example, what are they doing to the Sauvignon Blanc? It is one of the greatest in the US I think but not even mentioned in the replanting. I bet they will turn Mayacamas into a fruit bomb like Screaming Eagle, and raise the price to boot! Buy Travers' wine while you can!